Founded in 1869, Lake View Cemetery sits on 285 acres of land and was modeled after the great garden cemeteries of Victorian England and France. There are over 102,000 people buried at Lake View, with more than 700 burials each year. There are 70 acres remaining for future development. Anyone can be buried at Lake View, without regard to race, creed, religion or walk of life. Offering the beauty, serenity, selection, history, horticulture and architecture rarely found in other cemeteries. 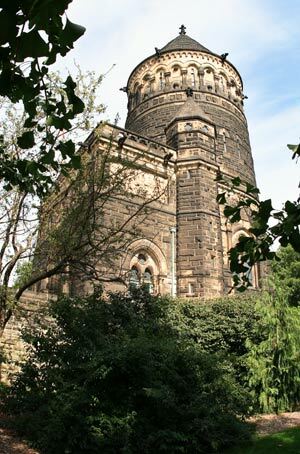 Highlights at the cemetery include the Garfield Monument, the Wade Chapel, and the Rockefeller Monument. Lake View Cemetery is also notable for its garden-like settings. Many of the family plots are set in small gardens unto themselves. Ornate statuary can be found throughout the grounds. Today, besides being used as a final resting spot, the cemetery is also used for weddings, picnics, and other family affairs. Definitely worth the effort to visit. Grounds are open every day of the year from 7:30 AM until 5:30 PM. The cemetery is named because it is partially located in the "heights" area of Greater Cleveland, with a view of Lake Erie to the north. It was modeled after the great garden cemeteries of Victorian era England and France. The Italian stonemasons brought in to create the Cemetery founded the Cleveland neighborhood of Little Italy just to its northwest.